Recently there has been much discussion surrounding the Town of Minto’s ongoing discussions in regard to moving the War Memorial Cenotaph in Palmerston from its current position in front of the Palmerston Library to the newly developing Lions Heritage Park. We have decided to provide a bit of history of the Cenotaph, by using newspaper articles. 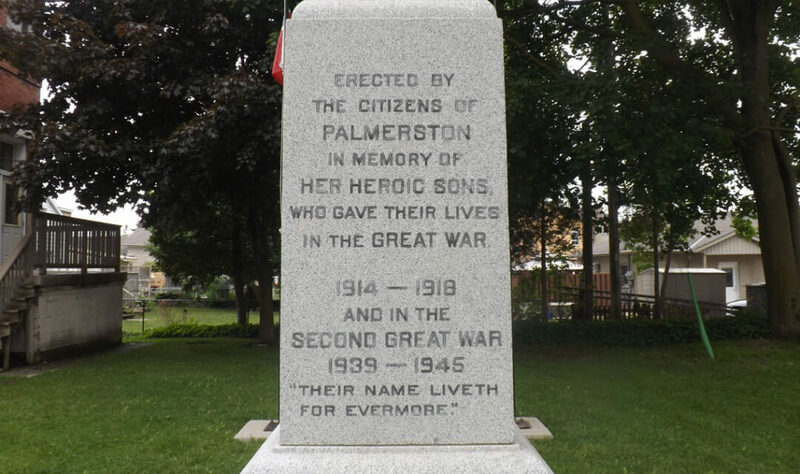 The Citizens of Palmerston have made all arrangements for the erection of a memorial in the form of a statue to be erected on the lawn in connection with the Public Library. The Statue is of Italian marble (a soldier standing at ease), the base of Grey granite. The cost including fixing of the grounds will be about $1500.00. The names of all the town boys killed during the war will be engraved on the base. They also contemplate erecting or placing a marble slab on the walls of the Library building with the names of all the boys that enlisted from the town. This slab of marble with approximately one hundred and forty-five names on it will cost $800.00. The arrangement of all details in connection with the erection and unveiling of a memorial was left in the hands of nine citizens. Mr J. B. Skelton is the Chairman and W.N. Munro is Secretary of this committee. It is proposed to unveil the statue on Thanksgiving Day. Moved by J.B. Skelton and seconded by N.Wilford that a check be drawn on the Treasurer for the sum of $1,000.00 in favor of Mr. Matthews, Treasurer of the Palmerston Memorial Fund – Lost. Moved in amendment by A.H. Baird and seconded by W. Murdeck that a check be drawn on the Treasurer for the sum of $1000.00 in favor of Mr. Matthews, Treasurer of the Palmerston Memorial Fund, when the Memorial is completed.- Carried. The Palmerston soldiers memorial has been completed and erected on the lawn of the Carnegie Library of that town. The structure is an oblong granite piece of workmanship mounted on a three-piece base and on either of the four sides of the upright are the names of the Palmerston soldier boys giving complete data. The unveiling will possibly not be made until early in the spring. Messrs Munro and Matthews reported on behalf of the War Memorial Committee and asked for a grant of $1,100.00 to pay for the Monument. Moved by J.S. 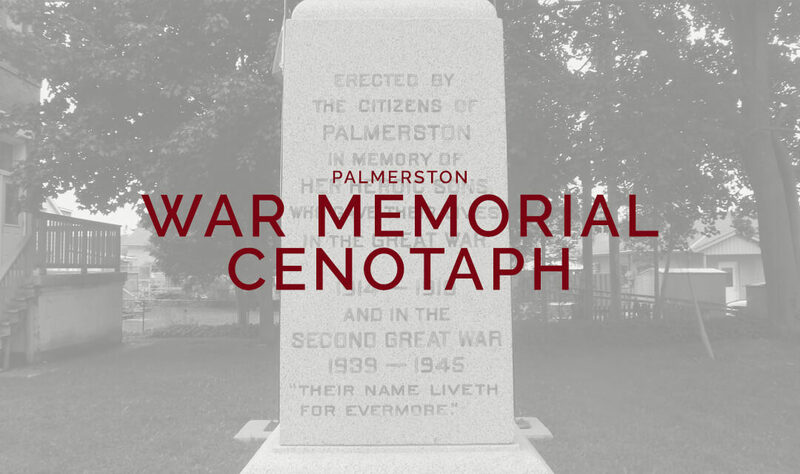 Cowan and seconded by R. Sandford that a grant of $1,100.00 be made to the Palmerston War Memorial Committee to be expended in helping to pay for the War Memorial erected in Palmerston on the Public Library grounds. The grant to be paid forthwith and to take the place of former grant made by Council for said purpose. Minto Farmers Market at the Museum!